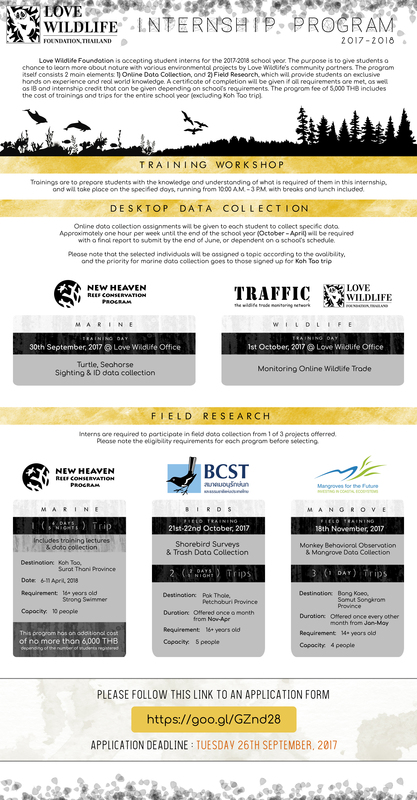 Love Wildlife Foundation accepted student interns for the 2017-2018 school year. The purpose is to give students a chance to learn more about nature with various environmental projects by Love Wildlife’s community partners. The program itself consists 2 main elements: 1) Online Data Collection, and 2) Field Research, which will provide students an exclusive hands on experience and real world knowledge. A certificate of completion will be given if all requirements are met, as well as IB and internship credit that can be given depending on school’s requirements. The program fee of 5,000 THB includes the cost of trainings and trips for the entire school year (excluding Koh Tao trip).